It’s time for apricots, that sweet part of the summer when the sun gets bright enough to make their delicate skins blush. I have a habit, partly encouraged by this blog, of making at least one celebratory dish for a fruit in season, especially if it’s a fleeting one. I feel a bit late on this, and if you haven’t had your good dose of apricots yet, you might want to soon. Next thing you know, you’ll have to wait until next summer. Here is what we did with our share. A classic, simple summer tart with a nut crust and white cream, only the apricots are combined with lavender, and encased in a jelly-like orange and honey glaze to make things a tad more exciting. I made it yesterday, and more than half of the tart is already gone. Paloma alone ate three slices. Now to the giveaway, we are really excited about this one. Our friend Elena has a natural skin care line, Wholistic, and they’ve finally launched their online store. You hear about all-natural products so often, only to find out that the all part has been greatly exaggerated and skewed. Wholistic skincare is actually all-natural, handmade with organic ingredients, free of synthetics and chemicals. It’s a true commitment, making such pure stuff of the best possible quality, and what Elena has come up with is truly admirable. We are so proud that Wholistic was one of the few companies selected by the Campaign for Safe Cosmetics to be listed in their Market Shift report. Skin is our biggest organ, and it readily absorbs anything you put on it, just like our stomach when we eat. Wholistic products are made with food-grade ingredients and are actually safe to eat. Aside from the purity issue, this skincare is serious joy for all senses, addictive really. We are giving away my personal favourite, the Rose Hydrating Mist, which is refreshing, smells amazing, and is perfect for the summer. Just leave a comment here until 7/15/12, 12pm EST, and we’ll pick the winner then. Arrange the apricots on a Teflex-lined dehydrator tray. Mix lavender and honey together in a small dish. Gently warm this mixture placing the dish in a larger bowl with hot water. Sprinkle or brush the apricots with lavender honey. Dehydrate at 115F for 2-4 hours. Combine all the ingredients in a food processor until thoroughly mixed and sticking together when pressed between fingers. Then evenly press the mixture into the bottom of an 8-inch spring form and create an about 1 1/2-inch wall on the sides. Combine all the ingredients in a high speed blender until smooth and creamy. Fill the tart crust and place in a freezer for 30 minutes to an hour. Once the surface is firm, arrange the apricot slices on top. Blend all the ingredients in a high speed blender until completely smooth. Pour over the apricots on the tart and refrigerate until firm. Not only do your recipes amaze me, but your blog is an exceptional piece of art!! Thank you for blessing us all not only through our tummies but through our eyes as well!! This sounds like a perfect thing to go with the apricots from my CSA. You have an incredibly inspiring blog. Thank you. I am definitely going to be making this! Looks delicious!! Wow. Beautiful and, I can only imagine, delicious! This tart looks scrumptious. But is there any substitute for the meat of fresh young Thai coconut? Your recipes are always beautifully creative and inspiring. Thanks for the giveaway opportunity! That tart looks magical!! Definitely going to give it a go! great recipe for the overabundance of apricots we have this year. love your blog, found it jut recently. Thanks! Very inspiring Blog. Thanks. Do you have a recommendation for a first raw dish that one might try? Beautiful, beautiful recipe, as always! I am so dedicated to non-toxic beauty and home products…so I love this giveaway. Keeping my fingers crossed! The Rose Mist looks wonderful! So does the Apricot Tart! Your tarts are always so pretty, really. Apricots are one fruit that I find improve with baking but I have never tried them warm from the dehydrator – I will have to see if that makes them better. :) Either way, I am sure this was a glorious dessert! I love your blog, your photos and your recipes, they all work! Thank you so much. Fantastic! Would love a piece right now! Oh this looks awesome! So excited to try a new ingredient, I have never used lavender before. I can’t wait to start! I love all the colour and beauty in your recipes. I have just found your blog and will begin introducing my children to your wonderful recipes. Thank you. Amazing! So scrumptious and beautiful! As usual your recipe and the photo’s look scrumptious! This time with the cream oozing out, I instantly started too drool, XD. If I can’t find Apricot, I’ll definitely make this with nectarines. Congrats to your friendw for their products on the new online webshop! Sounds wonderful also! Beautiful! Oh how I love fresh apricots…and congratulations to your friend on creating a truly ALL natural beauty line! This tart is so beautiful! I am sure it tastes even better than it looks as well. Love the combination of ingredients here, especially the addition of the lavender :)! 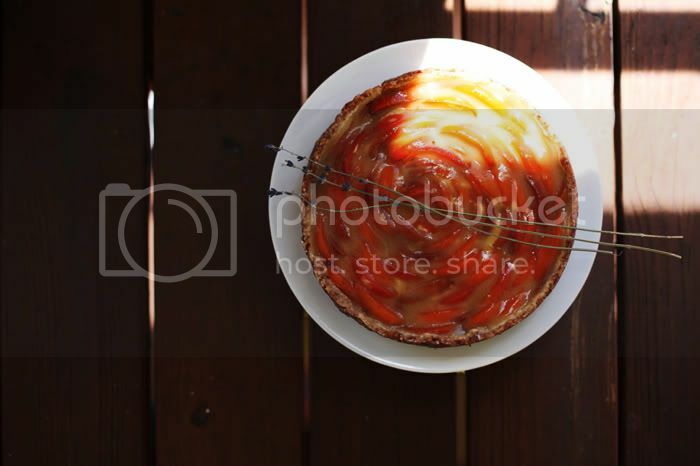 Oh gosh, this apricot tart looks so delicious! I just love reading your blog. :) And I’d love to check out Wholistic’s Rose Mist!! What a yummy looking tart! Can’t wait to try it and your products! I like that you believe what you put on your skin you should also be able to put in your mouth – so true. Thank you! This tart sounds amazing! I can’t wait to try it. And thanks for the heads up about Wholistic! Always lovely to find new products. It’s a beautiful tart, and I’ll be making it soon. YUM! I am looking forward to picking up apricots at the farmer’s market this weekend so I can try your tart. It looks delightful. I will be checking out your friends new site. I have long used rose water mixed with a drop of almond oil to remove eye makeup so rose mist sounds so soothing. How nice of you to help out a friend. I love using healthy skin products! I usually make my own, but it’s handy to have some other things on hand. very inspiring! I hope to be able to cook this way daily in the future. I am always on the look-out for good natural skincare products … it sounds like your friend’s got something good there!! BTW: Love your blog and all your amazing recipes, friends, and creative inspiration!! Thanks!! what a sumptuous looking tart! and i love the addition of lavender. 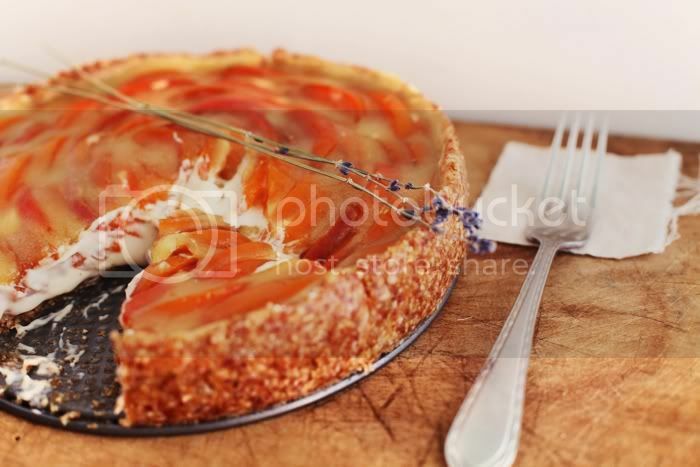 The tart looks glorious, and I am inspired to make something myself with apricot and lavender! The tart looks glorious! 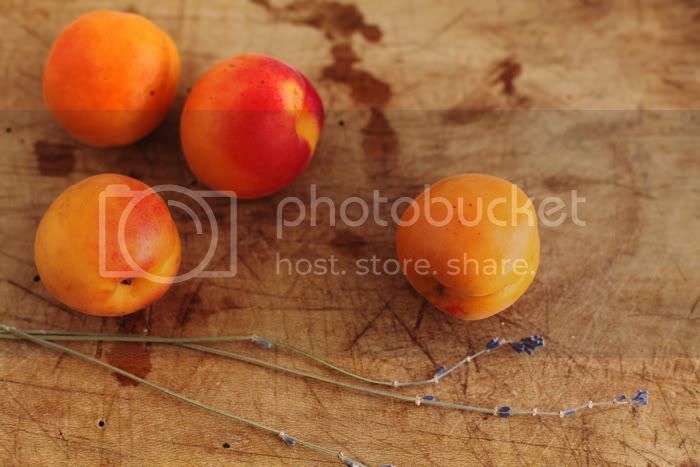 I am inspired to make something with apricot and lavender myself! I think this is your best tart yet, and that’s really saying something. I can see why Paloma ate so much. Beautiful photos, everything looks so alive, fresh and appetizing. Yuuuuuuuuh-meeeeeeee! time to go grocery shopping again!!! superbe recette et magnifique photo : je suis fan ! Hope I can find some good apricots. My last ones were under ripe. I love apricots and natural products so much! Thanks for the opportunity. This tart looks incredible. I’d love a chance to win the rose mist spray! While I often oogle the delicious looking meals, desserts, breads etc. that you make, I have yet to attempt to mimic your prowess (shy in the raw kitchen). However, this looks so inviting and delicious, I do not know if I an resist! Thank you for providing the opportunity to win the Rose Hydrating Mist by Wholistic. These kinds of products are so important! I hope I win! The tart looks delicious and the giveaway sounds great! I am definitely going to check out the online store! I use rose water for my face its awesome. What an amazing tart! I can’t wait to try this recipe! And the rose facial spritz sounds amazing too! Thanks for the work you do!!! What an amazing tart! I can’t wait to try this recipe! And the rose facial spritz sounds amazing too! Thanks so much for the work you do!!! What a delicious looking recipe! What a beautiful blog! Such an inspiration to me on my own raw food journey. Your blog has been my all time favorite blog for quite a while now. It is one of the blogs that inspired me to make my own blog (I made it two days ago, actually, so it’s very recent). I love the way you present every dish (presentation is such an important component to the art of food), and I love how each post has a story to go along with it. I feel this way about food myself. When I remember a food or a dish, I also tend to remember who I was with, where we were at, sometimes even what the people said and what they were wearing! Anyway, thanks. :) I am 17 (almost 18) and on my way to good health thanks to people like you. I also love natural skin care, health care, or anything-else-care products, so I will definitely check your friend’s online store out. Oh, and this tart looks AMAZING. I think I have some apricots in my fridge right now.. ^_^ I’m in luck! Great blog! Thanks for the lovely recipes and photos. 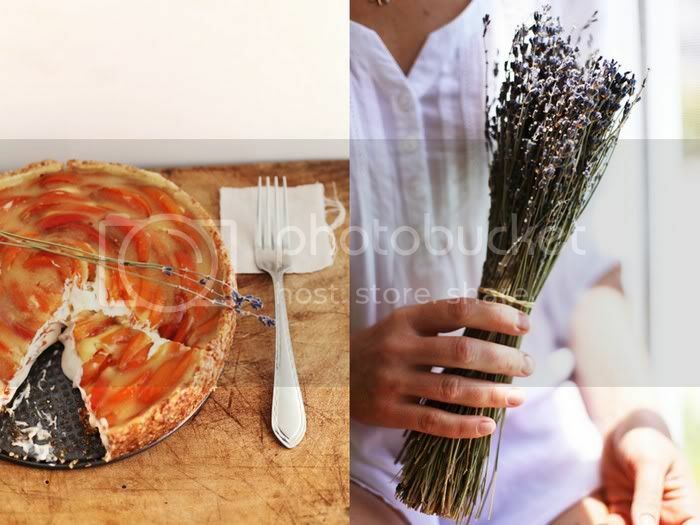 I love cooking with Lavender because it’s a scent that reminds me of my mom when I’m far away from home. All the Wholistic products look fantastic! I haven’t been on this blog for quite some time, and oh, how I miss it! Thanks my Russian lovelies <3 Love ya'll. I am a lover of things organic and lavender! This is a must try and the Rose Mist looks amazing! Thank you for this awesome blog! The tart looks absolutely delicious. Unfortunatelly I live in a country where fresh Thai coconut is not available. Can I take coconut meat from ripe coconut instead? This recipe looks amazing! You are so creative and inspiring!! I would love to win the rose mist. I live in South FL and its super warm down here! LOVE your blog!!! most inspiring!!! thanks for the chance to win such a beautiful product!!! This sounds yummy. I don’t really like cooked apricot but I think I will try that one ! Such lovely tart and a generous giveaway! Thank you for keeping us (your dear readers) inspired over and over again! The Tart looks so precious! Thanks for your comments, everyone! The winner of the giveaway is The Best Decade. To all those who asked about the substitute for young coconut meat, there is nothing quite like it. You can make the creme just out of cashews, but it won’t be as tasty and nice in texture. Mature coconut meat is usually too hard. Anon 10:26, you can substitute Irish moss with gelatin or agar agar. Uma, for a first raw dish, this lasagna is pretty impressive, and these chocolate truffles are easy and yummy. My goodness this is the best looking thing i’ve seen all day! How amazing is this creation?! Mouth is watering…..thank you! I’m so sorry that I missed this giveaway. I made the apricot tart, and the whole family loved it. Thank you so much for the recipe and inspiration! Добрый день, все время встречаю в ваших рецептах ирландсикй мох, а чем его можно заменить. У нас в Екатеринбурге его днем-с-огнем не сыщешь. Love the colors in your photos, very inviting. What a gorgeous cake! I have to make it now. WOW, the pictures, the food — you have skills!